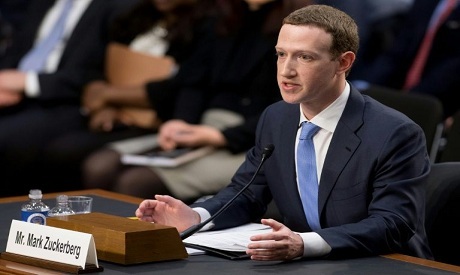 Facebook chief Mark Zuckerberg took personal responsibility Tuesday for the leak of data on tens of millions of its users, while warning of an "arms race" against Russian disinformation during a high stakes face-to-face with US lawmakers. In his first formal congressional appearance, the Facebook founder and chief executive sought to quell the storm over privacy and security lapses at the social media giant that have angered lawmakers and the network's two billion users. "It was my mistake, and I'm sorry," Zuckerberg said. "I started Facebook, I run it, and I'm responsible for what happens here." "After the 2016 election, our top priority was protecting the integrity of other elections around the world," he said. Swapping his customary T-shirt for a business suit and tie, Zuckerberg faced tough questions over how a US-British political research firm, Cambridge Analytica, plundered detailed personal data on 87 million users to be used in the 2016 US presidential election. Reiterating comments from the past few days, he took responsibility for the data misuse. Testifying was a new step forward for Zuckerberg, who started Facebook as a Harvard dropout in 2004, and built it into the world's largest social media company worth $470 billion. "It certainly doesn't feel like that to me," he said when asked if he thinks Facebook has a monopoly. "The average American uses eight different apps to communicate with their friends and stay in touch with people. Ranging from texting apps to e-mail," he said. But when asked if Facebook favored regulation of online firms, he said, "I think if it's the right regulation, yes." Lawmakers have suggested the election meddling and poor controls on personal data requires the government to step in to regulate Facebook and other social media companies which generate revenue from user data. "The status quo no longer works," said Senator Chuck Grassley, chair of one of the committees holding the hearing. "You have a real opportunity this afternoon to lead the industry and demonstrate a meaningful commitment to protecting individual privacy," Democratic Senator Dianne Feinstein told Zuckerberg at the rare joint committee hearing, to be followed by a similar hearing in the House of Representatives on Wednesday.